Brazil football legend Pele wants to light the Rio Olympic flame at the opening ceremony on Friday, but poor health may prevent him from accepting the honor, his spokesman said Thursday. 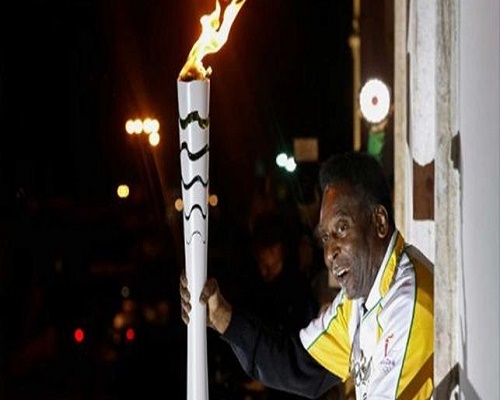 Doubts over whether Pele, 75, would be free to carry the torch to the cauldron in the Maracana stadium have been cleared up, spokesman, Jose Fornos Rodrigues, told AFP. The new question mark is over his health. “Getting free is not a problem now, but he has muscle pain which is affecting his mobility. He has gone to the doctor to see how things are,” the spokesman, also known as Pepito, said. Pele has undergone several hip operations and walks with a cane. On Wednesday, Pele told Globo television he had been invited to light the flame by the head of the International Olympic Committee (IOC), Thomas Bach. However, he said he had concerns over existing arrangements. Pele — real name Edson Arantes do Nascimento — is widely regarded as the greatest footballer of all time. He won three World Cups with Brazil but never competed at the Olympics.